Can top recruiting class, loyalty save Warlick’s job? Lady Vols coach Holly Warlick helped carry the program after legendary coach Pat Summitt’s early-onset dementia/Alzheimer’s type diagnosis in 2011. She succeeded Summitt as head coach. It looks like Butch Jones isn’t the only University of Tennessee coach on the hot seat. The Lady Vols’ second-round exit from the NCAA Tournament increased the scrutiny and pressure on Holly Warlick. After five seasons and no trips to the Women’s Final Four, the clock is ticking. It comes with the turf. Warlick forever will be judged against the standard of coaching icon Pat Summitt. It’s not fair, but it is her reality. And she knows it. Following a legend is one of the greatest challenges in coaching. Joe Hall had some great teams and won a national championship at Kentucky, but he was no Adolph Rupp. Bill Guthridge could never escape Dean Smith’s shadow. The list goes on and on. Warlick can relate. From her first day on the job as Lady Vols coach, she was measured against her idol and mentor. She’s 970 victories and eight national championships behind. You can count me among those who give Warlick the benefit of the doubt based on the grace and compassion with which she handled that hellish 2011-12 season. It was a nightmare. Summitt was diagnosed with early-onset dementia/Alzheimer’s type in the summer of 2011. Yet, she remained in the role of head coach throughout that season, with Warlick actually doing the heavy lifting. At SEC Basketball Media Days in October 2011, Summitt made one of her first public appearances since her diagnosis. She sat at a podium with Warlick beside her. It was clear that Summitt’s condition was worsening. She spoke in short sentences, often repeating that her goal for the season was to “cut down nets,” a reference to winning a championship of any kind. Meanwhile, Warlick filled in the blanks, talking about personnel, the schedule and other details. No one outside the inner circle of Lady Vols basketball can possibly appreciate how difficult that season was. By the time the SEC Tournament rolled around in March 2012, Warlick was spent. Trying to balance the responsibilities of overseeing the program while making sure her mentor was comfortable and protected took a toll. The Lady Vols won that SEC Tournament in Nashville. Accordingly, they cut down the nets, just as Summitt had hoped. It was the last time Summitt got the nylon spoils of victory. That Lady Vols team was beaten by Baylor in the Elite 8. A month or so later, a statement was released saying Summitt was stepping down from the job and would assume the role of head coach emeritus. She died on June 28, 2016, at the age of 64, after months of deteriorating health. No one was more affected by her illness and death than Warlick. I suspect Warlick wishes she could go back to way things used to be. She was more comfortable as an assistant coach than in the head coaching role. It suited her personality and her strengths. Plus, she loved working for Summitt. But the game has changed. Warlick is now at a coaching crossroads. Many fans are calling for change. It remains to be seen what John Currie, UT’s new athletics director, expects of the women’s basketball program. Let’s try to look at this rationally. Those that want Warlick out often compare her to Summitt in her prime. They fail to take into consideration that Lady Vols basketball had slipped considerably during Summitt’s last handful of seasons. After winning the national championship in 2008, none of Summitt’s last four teams reached the Women’s Final Four. In 2009, the Lady Vols went one-and-done in the NCAA Tournament, the only time that happened in Summitt’s remarkable career. That was followed by a trip to the Sweet 16 and two berths in the Elite Eight. If you compare Warlick’s NCAA Tournament record with Summitt’s last four teams, the results are comparable. Warlick coached UT to three Elite Eights and one Sweet 16 before the second-round exit this season. It’s not like the Lady Vols are completely irrelevant in women’s college basketball. On top of that, Warlick has a recruiting class many rank as the nation’s best bound for Knoxville this summer. Yes, there will be growing pains with that many freshmen playing significant roles but she deserves the chance to coach them. Warlick seems to understand she’s facing a critical season in 2017-18. Following the NCAA Tournament loss to Louisville, she was asked what message should be conveyed to the freshmen when they hit campus. Ironically, Warlick’s five Lady Vols teams have been marked by so-so play at point guard – the very position Warlick manned during her career. That should be remedied with the arrival of Evina Westbrook, who is ranked the top recruit in the country by at least one service. Some of Warlick’s harshest critics say she struggles with in-game strategy. It’s a fair criticism. Her Lady Vols teams have had trouble holding onto leads and closing out games. But with all due respect, I must point out that Summitt was not an X-and-O genius. She never claimed to be. She often said her keys to victory were defense and rebounding. In other words, she valued all-out effort over an elaborate game plan. While she may have had some gifted scoring threats like Chamique Holdsclaw, Candace Parker, Bridgette Gordon and others during her coaching career, the Lady Vols scored an inordinate number of points on offensive rebounds. On the Lady Vols’ way to the 1987 national championship, Long Beach State center Cindy Brown famously used the term “corn-fed chicks” to describe UT’s physical presence on the offensive boards. Often, the Lady Vols’ best offensive weapon began with a missed shot. Moving forward, the comparisons to Summitt will always be there. 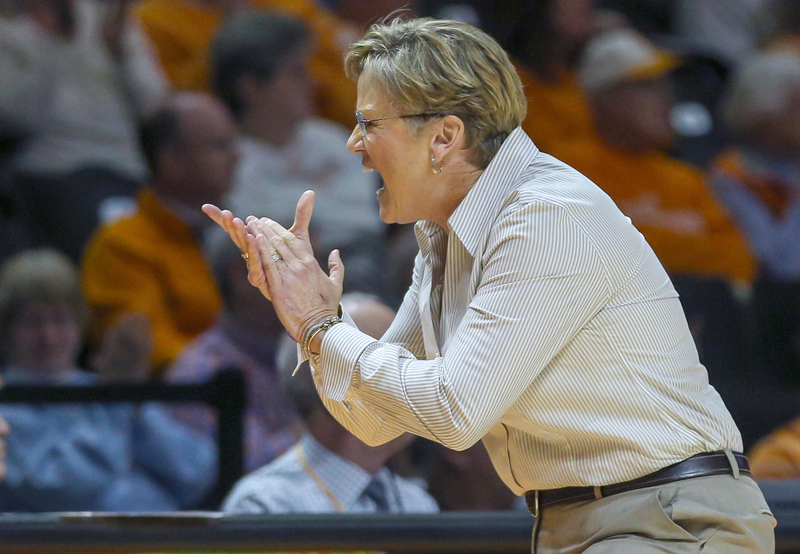 Now, though, Holly Warlick must find her own way as Lady Vols coach.